Captain Steve Smith admitted Australia had deliberately tampered with the ball during the third Test against South Africa. Smith said he was “incredibly sorry” for bringing the game “into disrepute” after team-mate Cameron Bancroft was caught rubbing a piece of tape, coated with dust from the pitch, on the ball while fielding. Bancroft attempted, after speaking to 12th man Peter Handscomb, to hide the tape down his trousers but the video evidence was clear and he was charged by the match officials after play finished on day three in Cape Town. He and Smith appeared afterwards at a press conference, broadcast live on Periscope by Cricket South Africa, at which Smith said: “The leadership group knew about it and spoke about it at lunch. On-field umpires Nigel Llong and Richard Illingworth, both from England, took no action after speaking to Bancroft but he was charged after the day’s play. I’m not proud of what’s happened, it’s not within the spirit of the game. My integrity and the integrity of the leadership group has come into question, and rightfully so. Bancroft said: “We had a discussion with the match officials and I’ve been charged with attempting to change the condition of the ball. “I was in the vicinity when the leadership group were discussing it. I was obviously nervous and with hundreds of cameras it’s always a risk. 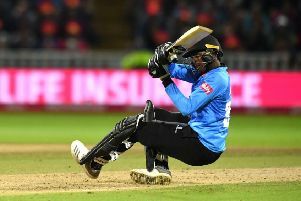 “We had a discussion during the break and on myself, I saw an opportunity to use some tape and granules from rough patches of the wicket to change the ball’s condition. Smith declined to “name names” but insisted the decision was taken by players rather than the coaching staff. “It’s not on, it’s certainly not and it won’t happen again under my leadership,” he said. “We thought it was a possible way to get an advantage, obviously it didn’t work. It was a poor choice and I deeply regret our actions. He insisted, though: “I won’t consider stepping down. South Africa took a commanding 294-run lead in the match after reaching 238 for five in their second innings, Aiden Markram with 84 and AB de Villiers adding 51 not out. That left them on course to take a 2-1 series lead into next week’s final Test in Johannesburg but the match was overshadowed by the Bancroft incident. Former England captain Nasser Hussain led the condemnation of Australia’s actions and referenced the 1994 incident which saw then-England skipper Michael Atherton fined for using dirt in his pocket to dry the ball. “Michael Atherton had a ‘brainfade’,” Hussain told Sky Sports. “This looks more like a pre-meditated, ‘We are going to tamper with the ball’. “You don’t just have a bit of sandpaper, or whatever that yellow piece was that he tries to hide down his pants. That’s a pre-meditated thing you take out there with you. Former Australia spinner Shane Warne had stern words for his former team, telling Sky Sports: “You can’t have that in the game.